Protesters have gathered at the national office of the All Progressives Congress demanding the removal of the John Odigie-Oyegun-led national working committee of the ruling party. 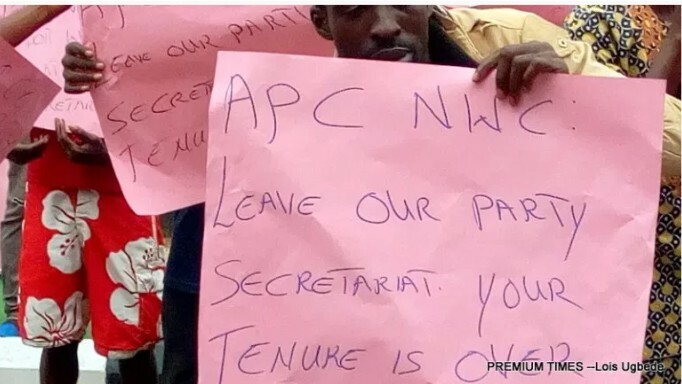 The protesters carried placards praising a leading contender for the national chairmanship of the party, Adams Oshiomhole. One placard read “Oshiomhole is our winner”, another said “Oyegun and co leave our party secretariat now”. The tenure of the present national working committee, NWC, is due to end this month and new officials will be elected at the party’s convention scheduled for Saturday. An earlier proposal to extend the tenure of the Oyegun-led NWC was rejected by party leaders including President Muhammadu Buhari. Mr Oshiomhole, a former governor of Edo state, has the backing of President Buhari and other key party leaders for the top position. Mr Odigie-Oyegun has said he will not seek re-election. A member of the publicity sub-committee of the National Convention Organising Committee, Abike Dabiri-Erewa, said 20 positions had been returned unopposed while 42 posts are being contested. Some of those officials who seek re-election are; National Secretar; Mai Mala Bun, Deputy National Chairman (North); Lawan Shuaibu, National Vice-Chairmen; Hilard Etta (South-south, Emma Eneukwu; (South-east, National Organising Secretary; Osita Izunaso and National Auditor, George Muoghalu. She also said there will be no “unity list”, referring to an list of candidates the party recommends to delegates to vote for on saturday.